This article covers Packet Swiched data, PS call flow between Mobile(UE) and network for downlink(to download data). It covers messages exchanged for GPRS attach and PDP context activation procedures between mobile and SGSN/VLR/HLR/GGSN. It include channels(PPCH,PRACH,AGCH,PDCH) used at layer 1 to carry various messages over the air. This article assumes that initial frequency and time synchronization is done between UE and Network as described in GSM tutorial in tutorial section. 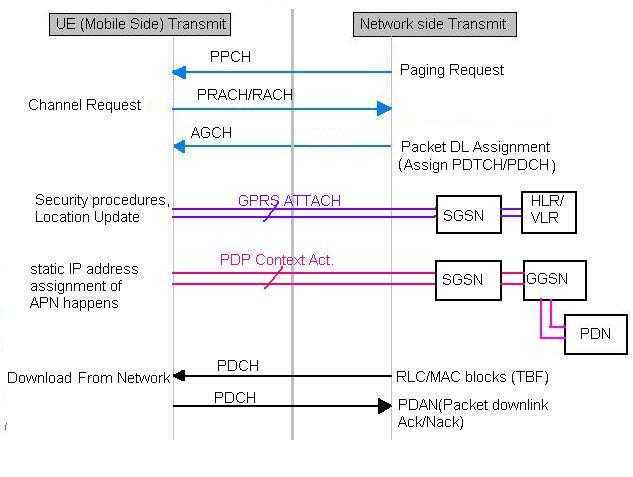 As described in the figure, Packet Paging Request(carried by PPCH/PCH) will be sent by network to alert mobile for packet call.Now RACH is sent by mobile(UE) mobile to network(BTS) and network will assign slot(single/multiple) for packet transfer. GPRS attach procedures are completed by mobile station for location update and to complete security check. Mobile in GPRS has three states viz. Idle,Ready and Standby. When Mobile is switched on it is in Idle state. After GPRS attach it switches to Ready state and it performs PDP context activation procedures as mentioned below. When there is no PDU to be transmitted/received and when timer expires it goes to standby state. It remains in this state till there is no PDU for transmission/reception. To establish internet connectivity IP address need to be assigned to the Mobile and connectivity with APN need to be established. This is done using PDP context activation procedures. PDP context provides routing information and QoS possible with the GSM/GPRS network. Mobile Station(MS) specifies network SAP and APN(Access Point Name) of the PDN to establish connection with. PDN stands for Packet Data Network.All the messages goes to SGSN/GGSN/PDN via BTS(Base Transceiver station). Tunnel is established between SGSN and GGSN for communication of protocol messages. As described in GSM protocol stack, messages flow between both mobile and network at various layers(layer 3,layer 2,layer 1(physical layer). The message flow is self explanatory to establish the Packet switched downlink data call in GSM.